A couple of weeks ago, we made the drive over to Froberg’s Farm in Alvin to pick strawberries. I told myself on the way over there I wouldn’t get carried away and come home with something crazy like 8 lbs of strawberries. We can always go back when we run out, after all. But when you’re standing at the front of a couple of acres of nothing but rows and rows (and rows!) of strawberries, it’s a little hard not to get carried away. So we came home with 8lbs of strawberries. The Foodie Groom and I went digging through the plants, looking for the most perfectly ripe berries while the Foodie Baby toddled down the sandy rows, in a rookie-mom-mistake white shirt, reaching in and selectively picking her afternoon snack. Strawberry juice + sand = strawberry mud. And strawberry mud and white shirts don’t mix, even when it’s only a 1-inch visible section. Strawberry Ice Cream was near the top of the list of recipes we wanted to make with our strawberry haul. We’ve made it several times before but it’s usually devoured before it and a camera come to be in the same room. The ice cream is tangy from the sour cream and lemon, sweetened from the strawberries. 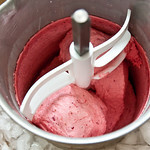 And a pound of the ripest, reddest berries yielded the prettiest batch of ice cream yet! Swap out the sour cream for greek yogurt for a frozen yogurt treat, or swap half the cream with buttermilk. Place sour cream, heavy cream, buttermilk, and lemon juice in a blender and blend until smooth. Add strawberries and their juices to the blender and pulse for a few seconds until most of the strawberries are blended. Refrigerate the mixture for an hour. Freeze in your ice cream maker according to its instructions. That is such a sweet picture of Foodie Baby. I’m with you on finding it hard to resist buying too much when fresh fruits or vegetables are involved. I can’t wait for farmers’ markets to start again soon. I’ve been getting by in the meantime with picking up strawberries at the grocery store and can’t wait to try this ice cream ! Thanks for sharing. I can’t wait to try this once the weather starts cooperating with what is supposed to be spring! 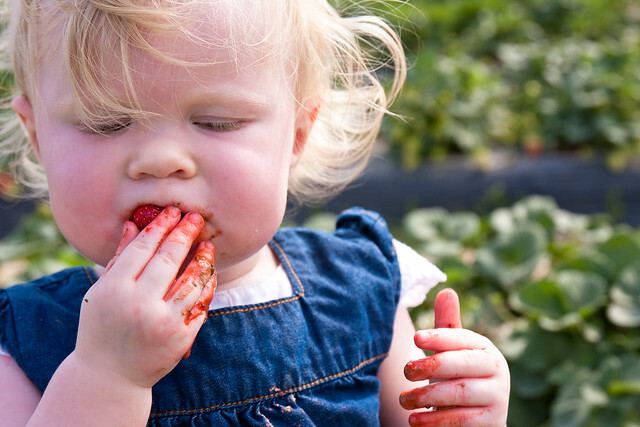 Strawberry picking sounds like so much fun! As I sit in my apartment bundled in a sweatshirt with cold rain falling outside, this post brings me hope that spring will soon arrive here as well, and homemade ice cream batches along with it. I’m intrigued. This looks so tasty it’s absurds. This looks amazing! We always buy too many strawberries too, and it would be awesome to have something to do with them if we manage not to eat them all! The ice cream sounds fabulous! I think it was meant to be when I bought fresh strawberries this morning without really knowing what I would make with them! This post IS IT! Thanks for sharing, going to start it right now! This sounds so delicious. Can’t wait to try it with greek yogurt. Just came across your post today. 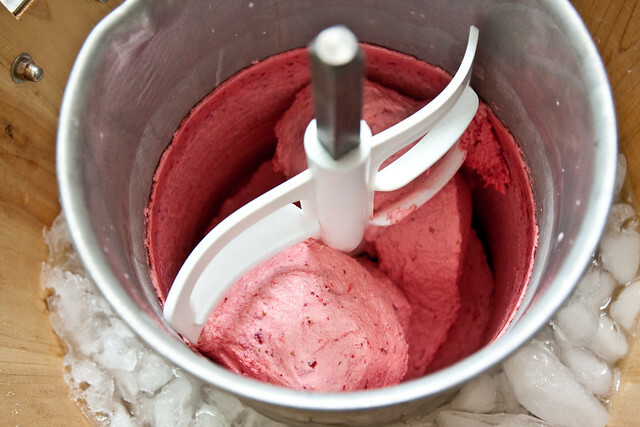 Funny enough, I made David Lebovitz’ recipe for strawberry frozen yogurt yesterday. So easy and so good. I used full fat Voskos Greek yogurt. My only complaint– it was actually a little bit too sweet. I should have checked the berries before I put all the sugar in. Guess I was expecting the usual crapberries I get from the supermarket, but these were a cut above. Thanks for sharing, I made Katie’s Strawberry Cake from your blog last summer and was just thinking about trying it again. Yea, strawberries! Sounds like a great ice cream recipe! Ha! Sweet baby girl, those strawberries were good! I also cannot contain myself and pick just what you need at u-pick farms. I am now notorious in my fiance’s family for dumping my purse in a frenzy to make sure there were enough containers for blueberry picking. you had me at vodka! Your blog has changed since I last visited. Your little girl is sooooo cute. I love strawberry season and I can never seem to get enough strawberries! I’ve never even heard of sour cream ice cream. I have to make this. i love both of those pictures! and strawberry ice cream is just to die for isnt it! THIS BLOG is Adorable and clever and fun! I love it- I found it trolling for cute pie images for a mood board for a new client doing a pie bar at their Lake house! I might use it! Super fun and cute ideas. Cant wait to read more!